Just like development where you don’t need to know a thing about computability or Big O notation to write code and ship useful and reliable software, you can work through machine learning problems end-to-end without a background in statistics, probability and linear algebra. What advice would you give to someone who’d like to implement some basic/intermediate algorithm (from equation to code) in Matlab for example? Which algorithm should I start with, considering I have a fair background in maths, not so great in statistics and at the beginning of ML. Start simple, say linear regression (using gradient descent), kNN, naive bayes or Perceptron are great “first” algorithms to implement. Pick one. Survey multiple sources, including papers, books, other peoples code, blog posts tutorials and so on. Use them all to help you get across the line. The goal is a working not a pure implementation. Make it work, then make it beautiful/elegant. Hello Jason, Thanks for such a wonderful and elaborative ML learning plan. I was bit confused before I found this article, the way you explained really suit me. Thanks. Thanks, I’m glad to hear it helped. This is amazing; as a self-taught computer geek, I find the mathy parts always the most complicated – I always struggled with math in school, and it wasn’t until I started programming / analysis that I realised I could do it. I have tried the Coursera course, spent a ton of money on ebooks from Amazon, and always get lost in the math (usually around Chapter 2). The way you’ve presented it here makes perfect sense and is very much aligned to the way I think, so thank you! I’ve signed up for the email based course and very excited to read more of your blog!! Thanks, I think your experience is more common that most people think. There are many ways to learn and get good at a subject like programming or machine learning, and the “traditional” is not always the best, most efficient, most fun or suited to everyone. Thanks for the insight. This exactly how I’ve felt while trying to learn ML.Much appreciated. I really like you are emphasizing that one should not be scared away by the mathematics that are behind the machine learning algorithms. Scientists and other programmers did indeed already cover many details for us so that ML algorithms can be used as a toolbox. I believe the manner you describe is a more natural to discover ML: get your data, try-out some out-of-the-box ML algorithms like SVM or Random Forests by trial-and-error and expand your knowledge in those algorithms. Maybe you will end up writing your own implementation but it is not the place to start. Data preparation and feature engineering are a critical part of ML, if you get those right, the ML algorithms provided by WEKA, Scikit-learn and other packages will suffice. (See also the paper of Domingos (https://homes.cs.washington.edu/~pedrod/papers/cacm12.pdf) for this). I think it’s a tragedy that so many developers give up on machine learning because of the math. It’s such a fascinating and fun field and developers have such an important contribution to make in freeing powerful methods from academic papers and archaic sample code. Thanks Jason for this great blog. I wanted to know if Preference Learning also follows the same pattern as Machine Learning. Because I understand Preference Learning is an extension of ML where the data is adjusted according to the user preferences. Hi Sriram, I must admit that I don’t think I’ve done any work in preference learning, but I expect the method laid out in this post for studying machine learning would be applicable. Check back in and let me know how you go. Hi Sriram, actually this practice-focused methodology applies to any engineer and even any knowledge learning (including like natural science where you need to practice solving problems, science of law where you need to practice debating, and many other areas) where experience is very demanding and invaluable. The best way for learning and teaching these highly experience-dependent areas is something like ‘practice — learning — practice’, where students first come with some existing projects with problems and solutions (practice) to get familiar with traditional methods in the area and perhaps also with their methodology. After practicing with some elementary experiences, they can go into the books and study the underlying theory, which serves to guide their future advanced practice and will enhance their toolbox of solving practical problems. Studying theory also further improves their understanding on the elementary experiences, and will help them acquire advanced experiences more quickly. Unfortunately, to my knowledge and experience, traditional teaching in university by professors often totally omitted the first important and necessary practice part, leaving only ‘learning — practice’, making the learning progress like a castle in the air, abstracting knowledges, making them completely separated from practice, and confusing students. Even worse, faculties in universtiy despise people teaching practice, because they are equipped with advanced tools (mathematics and science) and they believe these practice is very simple (although they scarcely ever practice because they are bosses). This totally wrong and harmful approach misleads generations of students. The most efficient and best way is, as already mentioned, ‘practice — learning — practice’. To my knowledge, this approach was first proposed by Chairman Mao Zedong in 1975 (during the Cultural Revolution), in a instruction called ‘7-21 instruction’. Dr Jason it is really enlightening one. I think I better get started to use them for my work in hydrology. Hi, Jason, this is singlehandedly the best advice ever. I’ve toyed with the idea of getting started with machine learning for a long time but after reading this, I’m on it. Excellent. Start slow and steady and email me if you have any questions. I’m eager to hear how you go. Nice post, as always! Glad to see your blog is active again. Really appreciate your insights. Beautiful! Thanks for really bringing it, in this one, Jason! You’re welcome Jonny, thanks for the kind words! Would it be possible to open a *.data file instead of a *.arff in WEKA? I too belong to the same pool where I was frustrated and decided to leave Machine Learning. Some how I started exploring H2O and the interest was flown back into me. Thanks a lot for helping many people like me. And last but not least, thanks to my friend for redirecting my ML vehicle here. I started to take the Coursera Stanford Machine Learning MOOC but I had some problems when I tried to submit/up load my responses to the exercises of the course because maybe the nature my internet connection here in Cuba. This “failure” almost killed my motivation, but now I’ll take your approach to pursuit my goal to become a machine learning practitioner. Thanks a lot for your advice. Thanks for the wonderful effort of making ML more beginner friendly. I am a beginner and I have benefited from your work. Switching between reading and practicing works best for me. For example If I find 2 hours for dedicating to ML on a given day, I enjoy it most when I read for an hour and practice (relevant or irrelevant material) for an hour (in any order).This makes me feel that I am having fun as well as making some solid progress on the fundamentals. Of course, the mix does not have to be exact 50-50, but whatever suits to the current point of expertise/enthusiasm. Over a longer period of time, I believe it covers more or less same ground as any other approach. I chose scikit-learn and WEKA as practicing platforms, and I am reading Bishop’s PRML alongside. This blog helped me a lot on how to start. But i wanted to be research student. My approach should be different because my priority should be algorithms rather than the solution most of the time. Can you suggest me any approach for that. If you are a research student, my advice would be to commit to the academic approach as taught in university. Read the textbooks, take the courses and learn machine learning from the bottom-up. I just found your site and started here. Excellent advice. I have spent the better part of two years learning as much as I could in statistics, linear algebra, calculus, programming, databases and machine learning, mostly through Coursera. I did take Andrew Ng’s course fairly early on and did well, but still felt that I was a long way from the point where I could develop my own applications. I also came away with the impression that I had to fully understand all of the algorithms, essentially by programming them myself! Since then, I have started other machine learning courses that do use libraries (Dato). Now, I can see that you don’t have to reinvent the wheel to make progress. In a way, I thought this was “cheating”, and it did hold me back. Anyway, thank you for this site. I hope to work my way through all of it and follow the many resource links that you have put together. Thanks for sharing Paul I’m happy the post made an impact on you. Thanks for sharing Paul. This gives jump start; however can you list out level of complexity in ML in “Your next step section”? Thanks for outlining this approach. It makes me feel a lot better about approaching machine learning. I knew that it was possible to understand and use machine learning without all of the complexity of the math and algorithms. Having you confirm it really drives the point home. I’m excited to have come across your web site! Thanks for the kind words Mehul. I hope that I can help you on your machine learning journey. First of all, I want to thank you for such an amazing post. As you said, it is very disheartening for young, fledgling developers when they are berated on stackoverflow and quora for not knowing what to do. They are given a curt and dry reply- “Go study Algorithms/Data Structure/Stats/Probability/etc.” Not because they are lazy to read but because they just don’t know where to start. This behavior just breaks their heart and rips any aspiration. So thanks, for being so kind to us novices. Now, I have a good theoretical understanding of Machine Learning thanks to a class I took- classification, clustering, types of errors, bagging, boosting, etc. I have tried many of these methods using Weka and feel comfortable with it. Now, I want to take the next step- somehow apply my programming skills to solve problems. What do you recommend my next steps be? I ask this, because I am somewhat in the middle and don’t know which direction to proceed. This seems worse to me than not knowing ML at all because I would’ve atleast started with an open mind. Thank you for this amazing post. This made me very clear how to proceed, what to do and what not. I have a small doubt about programming language used in machine learning. Some articles suggested using python while some books are using R language. Please guide me which language I should choose. Thanks Jason, some of my deepest concerns in studying ML are cleared. Im glad I found your blog atleast now as I started thinking that I cannot teach ML myself, though I have lot of interest in the subject. thanks Jason , i come from china . your advice is awesome. i feel been suddenly enlightened. Hey Jason, I am new to machine learning, I just read your article and feeling motivated. I want to do a machine learning project on handwritten digit recognition. I have no idea how should I start with it. Can you give me a brief guideline on how should I start and what are the things I will be needing to learn. I have already found a data set on machine learning repository. Excellent article. The problem is when you are really tired of MOOCs, Big fat Statistics Books and Kaggle , KDD you stumble here. Irony is you do not search for a similar blog when you start ML. I have a 9-6 job and a non programmer. I am keen to learn ML for two reasons. 2. Use it in my day to day job as I work with lot of data ( I am in Project Management in a Semiconductor Company here in Bangalore , India). Its been a year, I have tried, R, Python, Octave, MATLAB, Codeacademy, Spark you name it. I know some stuff now, but my thinking was clouded. Thanks Jason. You are my ML Guru now. Coming from an Indian who really means it when he says the word “Guru”. I haven’t coded in … many … years but always love data analysis and stats. With machine learning/data science being a hot area and my son learning Python, I’ve been looking for ways to learn and I’m lucky enough to stumble across your post here. What a relief to find that there’s a quicker way to play with ML without having to understand all the esoteric concepts and theories! What a brilliant approach you suggested to novice like me! and already find it daunting to understand all equations and algorithms. I took a refresher book on Linear Algebra( I took that before many years and now I am lost) but it is taking lot of time to go through. I received your email in mean time with links to this blog and found right approach to ML. I will follow your advise and take hart to plunge in learning ML right way. You saved me lot of pain and time. Very useful article. I already tried watching Andrew Ng’s video lecture. Then I came to know that I don’t know much statistics and Probability, Linear Algebra, …… etc. Then I started with Statistical Learning Course from stanford. But half way only … I was really confused with all these approach but now I found good way! Thanks for the article. But i have been struggling to get into core M/C learning or Data science stream because everywhere they ask for hands on experience (R/python/ etc)…. As a reason i have been frustrated a lot and trying to layout a plan for myself so that I can focus on one thing and get expertise of the same so that i can leverage my degrees as well. I don’t think I’m anywhere near ready to start Machine Learning, as I don’t even know a language just yet, and have never developed anything in my life. I’ve just started learning Python at nights, but since I don’t work within IT (yet), it is slow progress. Just after some advice, seeing as you’ve got a PhD in AI (philosophy). My goal is to work with intelligent agents and help shape the future of AI; I’m interested in deep learning, reinforcement learning and some NLP. Since I don’t have a strong Computer Science background, would you recommend that I look at going to university, or do you think there is a better way to learn from the foundation upwards? I think you can learn the practical steps of applied machine learning without going to university. Hi Jason! I read your article “Machine Learning for Programmers: Leap from developer to machine learning practitioner”(the one talks about the traditional bottom-up approaching system.) I am very very grateful someone just shoot out things that I am so confused about !!!! I am watching the Stanford MOOC, I pushed myself so hard(to the huge gap) that I realized I lost some motivation(which I think is the most important) about even computer science. Then I found you and the article online this morning. Not exaggerating, you are my career saver. After 2 entry level computer science courses(they motivated me so much about being CS major) in college, I just felt wrong along going further about school which is too far away from the real life problem solving. Friends around me they admire school so much, they are so comfortable with the school system as long as they got good GPAs. I could go pages, just don’t want waste your time to help others. All I want to say is thank you. Finally, I got a pro confirmed my confusion. Thank you so much!!! Thanks for the kind words Mike, I think your comment is inspiring. Hang in there, Machine Learning is so much fun when you focus on the applied side! Thanks for your handwork, excellent ! Due to limited opportunities in embedded domain, I would like to move to ML/Deep learning. How tough will it be for me to move? I have 14 years of embedded sw development experience. Jason, this has been very helpful. I was in the dilemma whether PhD first or experience first. And when I concluded relevant industry experience really counts towards profile building for PhD, I found this master piece. I am a developer with database, data warehousing BI with c# programming experience. Thank you so much for sharing your thoughts, looking forward to see more of your work here. I’m so glad it helped kartik, thanks for the comment. Thanks a tonne for such rare and wonderful article. I am a research student and I have opted for machine learning domain for my research work. Can you please help me through some of my doubts regarding interface between weka and matlab that can be used in research work for machine learning. I am using classification technique in ML but somehow confused how to proceed and with what out of the two. Hi Astha. Sorry I am not familiar with the Weka to Matlab interface. I cannot give you good advice. Great article! I work in algorithm development and have an academic background in intelligent systems but not all the necessary math so i can see the same frustrations you describe. I think the general information overload in the “data science” area (as well as many others like software development) adds to the problem and sometimes make it seem unsurmountable. I like your focus on the “machine learning engineer” type role too, and the approach of starting practical and learning the deeper layers as projects are undertaken. Do you have any advice for trying to encourage “old school” algorithm developers to move to machine learning approaches? I find this an issue in my current role, that they do not understand or “trust” the algorithms and therefore stick with old non scalable ways of making models. I know this post is intended for developers but would you suggest this same process for non-developers? Would you suggest I learn a language like Python first before I start taking the approach you suggest? Yes, this approach works just as well for designers and other non-developers. I would suggest starting with Weka, that way you can learn and get good at applied machine learning without programming. It is much harder to learn 2 things at once – programming and machine learning. This post fits me perfectly. Wish I had seen it earlier. I set myself up for “failure” by picking a complex and dirty problem as my very first ML project and on top of that, it’s my thesis topic. Great combo, eh? I’m glad you found the post useful Ivan, and well done on spotting the hard way compared to the easy way. i dont have any programing knowledge,i want to know about machine learning. Thanks for the post, very intriguing. It would be interesting to hear from someone that has followed through with this advice and has made the transition from some type of software development position to a machine learning software engineer. Thanks for the nice article. I see a ray of hope again after going through the blog. I’m now around 45+ years, worked mostly in traditional software companies and now at management position which i dont feel i can do justice with and I’m interested in ML( mainly in R&D) i was very good as a student in maths and engineering too( always stood among top 3 in universities, though 25 years back ). I’m ready to take a break of 6 months to dive into this but do you suggest at this age should i take this risk? can i focus again and play with maths after so long? Need your advice, please help if i should even think of this stream? Yes. My advice would be to be laser focused on how to deliver results, not the theory. Of course, you can study whatever you want, but the shortest line between you now and being effective is learning how to deliver results – working through predictive modeling problems end to end. You can get a long way in a few weeks of working every day, let alone a few months! Thanks Jason, i’m hopeful it will be useful. I will connect back after few weeks. I am a sophomore year student at IIT Guwahati, India. I am a UI/UX design student. This article is quite insightful as to how one can learn and apply ML. But it is more inclined towards developers switching to ML. I have recently developed interest in ML and although being a design student, I have completed courses in Linear Algebra and calculus in my freshman year. I’m a bit confused as to what would be my career prospectives if I choose to pursue ML with a Bachelor of Design degree. If you can learn how to provide value to a business with machine learning then you will have a “career”. OMG, Jason you are a pro. I’ve already made a planning on how to learn by myself an entire BS CS curriculum before appling to a Ms in Computer Science and finally do ML. What you have just told me here is “You can do whatever you want, but you don’t have to wait to start doing ML”. This is amazing, this totally makes sense to me…. I’ll follow your advice, and start working as soon as posible, and then make sense of it on my way to ML engineering. Again, Thank you so much Jason, keep doing what you are doing, dudes like you have a prime role in making ML change the world. I’m glad to hear that Daniel. Stick with it. It’s worth it! Great article Jason. Now I think even a novice developer like me can also learn ML. Thank you for the enlightenment. Thanks Nikitha, I’m glad to hear it! Very inspiring post and you hit every point that I am struggling with. Great stuff! ML here I come! I’m glad it helped Fille. Hang in there! Hello sir, i have just completed my B.E in IT branch. i have recently developed interest in ML, but i don’t know how to begin. I have tried everything blogs, youtube videos but they all start with intermediate level. I have good knowledge of Python and i love solving calculus problems. could you suggest me where to begin? The bunch of articles and exercises were really helpful with me to work in ML. Thank You so Much! Thanks Nirodha, I’m really glad to hear that. I am a developer trying to learn ML and you laid out such a beautiful path. You mapped it out amazingly. Thanks in advance… developer –> ML engineer… eventually data scientist. I will scavenge your site until I bleed it dry of knowledge… keep it coming. Thanks Todd. Let me know how you go! If I have a dataset containing 2 columns, one of them is data in Chinese characters and the other is numerical values. In this case, how can I do the data transformation and feature engineering? It depends on your prediction problem and what the characters and numbers represent. suppose the prediction problem is that we want to find the potential users of new service in a bank. the characters represent the summary of users’ credit summary and the numbers represents users’ deposit in that bank. So, how to do transform the characters into numerical values in order to do feature engineering ? This sounds like feature engineering. Maybe there are systematic things you can pull out. Maybe turning all the text into numbers is the way (e.g. bag of words or word embedding methods). I would recommend testing lots of different approaches and see what works best for the problem. Hey, Jason, you see I am currently pursuing my bachelors in computer science and I want to do Django web development first and then move on to machine learning so what path will fit me right? I don’t know, pick a path that best suits you. Hey, I want to classify a word document contents using naive bayes algorithm in python. So, any one can give me some help or example so that i can implement the same in my problem. I will have a ton of NLP examples on the blog soon. Thanks, I’m glad to hear that. Hang in there! Thanks, Jason ! A good and convincing article, which made me clear. Thank you for the great article and site! Super cool that your doing this. I’ve been a top down programmer for most of my career. I needed to accomplish as task, I then developed/found the skills/tools, techniques to accomplish that specific task. For a number of the projects I actually didn’t understand a lot of the underlying concepts or math until after it was implemented, sometimes even after a number of years… But I was able to use those tools and concepts to successfully deliver. Of course of over time I’ve developed a pretty broad skill set I still don’t have some of the basic knowledge a fully educated software engineer has. So I commend your approach, it is the exact approach took in the past and am now taking with machine learning. Now that found your site I plan on going through a lot of it. 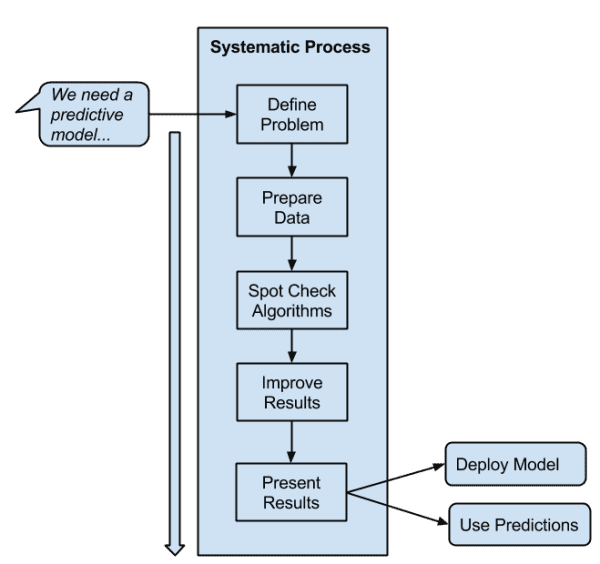 To start though I do have one task that I do need to accomplish with ML – Predict a timeseries. Then improve that prediction over time as more data is acquired. Would you have any additional suggestions for me in this case? My best advice is to focus on the process of working through problems end to end, everything else makes sense (or can be ignored) through this lens. Your advice/methodology gives me strength,power and confidence to see ML as simple as possible. The Gradient steps will help me understand the problems with minimum errors and soon i will find a clear path to ML. I gone through article. I still have confusion . I used Weka by not focusing on algorithm like linear regression and gradient descent . But at the end I found lost myself again asking the same question is really a software developer can become machine learning developer. I did not able to make the decision whether to under weka dataset i had to learn basis algorithms. Sorry this might be a dumb question but i found myself lost. Why, what was the problem exactly? Perhaps I have some suggestions. weka does not gives me steps to code the same algorithm which is classified by the tools. How to convert this knowledge into python programming . Weka teaches you the process with a point-and-click interface. In Python you can code the process together yourself. I am a professional developer for some years with good coding skills(my Python skill is okay or average) and very poor math skills, I can spend about 3 hours (at most) per day to learn about ML every day, 5 days a week, how long do you think I can finish the all 12 books and be ready to work on real ML projects in reality? I know this might sounds like a dumb question, but I really need your opinion before I can dive in this domain and seriously do something. Some people start adding values in a few weeks, other take years. It come down to how much you focus on the process of working through problems systematically and delivering a usable result. It seems my last comment was gone? Damn, I wish I read this before I started. As a dev I have no idea had how to approach it. I feel like I’ve read quite a lot and progressed very little in comparison, feeling pretty stupid and very frustrated with trying to understand all the math and theory going on. I feel like this is the key info what I was missing, just knowing how to approach this whole thing in the situation from a developer’s point of view. I think this article is a game changer and big eyeopener for me. Thanks you very much for this!! This is a must read for every developer trying to get into ML. Thanks, I’m really happy that it helps! Me too, I wish I found this before I started an year back. lost in learning mushrooming tools, especially Programming in python, instead of focusing on core ML. Thank god I found this. Thanks, I’m so happy it helps! I like your approach top-down (instead of bottom-up) method as immersive way to start delivering specific solutions in Machine Learning, through a big spectrum of particulars and full solutions, even if the pillars as developer (math -calculus, linear algebra, statistics-, programming language, API knowledge, etc) are not the best, because of our current university degree or study background lack . I think it is easier start “mutating” small part of the final code provide by you in every post instead of starting from scratch (bottom-up) every time. That reminds me a process as imitating biology; I can construct a new life entity starting from unicellular, combining into multicellulars, later on producing organs differentiations, etc. that is the “hard way” of standard university education or just simply change some “genes” or “mutating” in a similars animals to obtain some skillful new life differentiation just from the beginning out of the blue. Even if the new life cab be reproducible you can create new lifes in a sustainable way. I estimate this the way you start and the final reason of your posts success. In addition to that, and you do not mention, you can always going back and study deeper into the pillars of statics, algebra, calculus, etc to strengthen your basic knowledge …any time you are interested to know the roots of something you just have done, but do not know the fundamentals. Thanks Jason for your invaluable job ! Indeed, you can always circle back and go deeper, but only in service of getting better results (e.g. directed and with a context). bro… where ever you are… u r awesome dude…. What a convincing (most positive) post! You just nailed it. Thanks for this post, it was very motivating, I have a question, what difference does a linear regression algorithm from the perspective of machine learning and a linear regression algorithm from the perspective of statistics? My question is oriented to, why is it called machine learning? What is the change, if I solve a problem with statistics or if I address them with ML? What is the difference? Thanks again for your help. Same method, just more data and automation. Linear regression was devised to be calculated by hand.